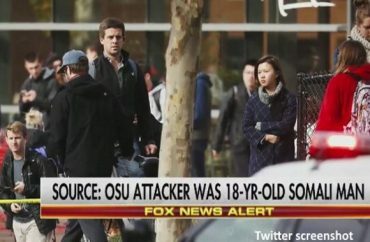 The Ohio State University student who allegedly ran over several students and stabbed others to defend Islam should not have been shot by police before he could hurt more people. That’s the explicit message coming from the OSU Coalition for Black Liberation, which added Abdul Razak Ali Artan’s name to a list of every person of color that has been killed by police since October, The Lantern reports. “In some cases, the deceased may have committed acts of violence against others before they were killed. Perhaps they were domestic abusers, perhaps they threatened or killed others. This possibility is not something to shy away from. The protest against police brutality extends to the innocent and the guilty alike, because we know that no matter the crime, justice and due process don’t come from a cop’s bullet,” [Women’s, Gender and Sexuality Studies major Maryam] Abidi said while reading the eulogy. “Even compassion has been politicized, as we saw with the diversity officer who’s being attacked for daring to say let’s show compassion towards a fellow Buckeye who made tragic, tragic mistakes,” [Associate Professor of English Pranav] Jani said. They were also encouraged to attend a socialist-sponsored rally against President-elect Donald Trump’s visit to campus Thursday, where he is expected to meet with victims of the car-and-knife attack.